Search has been vital to artificial intelligence from the very beginning as a core technique in problem solving. 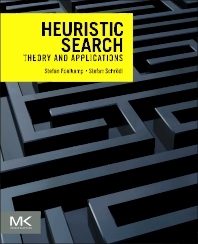 The authors present a thorough overview of heuristic search with a balance of discussion between theoretical analysis and efficient implementation and application to real-world problems. Current developments in search such as pattern databases and search with efficient use of external memory and parallel processing units on main boards and graphics cards are detailed. Heuristic search as a problem solving tool is demonstrated in applications for puzzle solving, game playing, constraint satisfaction and machine learning. While no previous familiarity with heuristic search is necessary the reader should have a basic knowledge of algorithms, data structures, and calculus. Real-world case studies and chapter ending exercises help to create a full and realized picture of how search fits into the world of artificial intelligence and the one around us. Stefan Edelkamp is senior researcher and lecturer at University Bremen, where he heads projects on intrusion detection, on model checking and on planning for general game playing. He received an M.S. degree from the University Dortmund for his Master’s thesis on "Weak Heapsort", and a Ph.d. degree from the University of Freiburg for his dissertation on "Data Structures and Learning Algorithms in State Space Search". Later on, he obtained a postdoctoral lecture qualification (Venia Legendi) for his habilitation on "Heuristic Search". His planning systems won various first and second performance awards at International Planning Competitions. Stefan Edelkamp has published extensively on search, serves as member on program committees (including recent editions of SARA, SOCS, ICAPS, ECAI, IJCAI, and AAAI) and on steering committees (including SPIN and MOCHART). He is member of the editorial board of JAIR and organizes international workshops, tutorials, and seminars in his area of expertise. In 2011 he will co-chair the ICAPS Conference as well as the German Conference on AI. Stefan Schroedl is a researcher and software developer in the areas of artifical intelligence and machine learning. He worked as a freelance software developer for different companies in Germany and Switzerland, among others, designing and realizing a route finding systems for a leading commercial product in Switzerland. At DaimlerChrylser Research, he continued to work on automated generation and search of route maps based on global positioning traces. Stefan Schroedl later joined Yahoo! Labs to develop auction algorithms, relevance prediction and user personalization systems for web search advertising. In his current position at A9.com, he strives to improve Amazon.com's product search using machine-learned ranking models. He has published on route finding algorithms, memory-limited and external-memory search, as well as on search for solving DNA sequence alignment problems. Stefan Schroedl hold a Ph.D. for his dissertation "Negation as Failure in Explanation- Based Generalization", and a M.S degree for his thesis "Coupling Numerical and Symbolic Methods in the Analysis of Neurophysiological Experiments". Senior Scientist at Yahoo!, Inc.